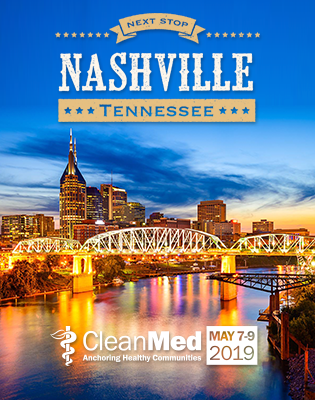 Applications are due March 6, and awards will be presented at the May 9 Awards Gala at CleanMed in Nashville. The Practice Greenhealth sector performance team spent considerable time connecting with members for feedback on the awards process. What are the top changes applicants can expect for this year’s awards cycle? For starters, we cut more than 200 questions to save our members time. We also added features like enhanced navigation and an improved application portal. A new page view for health systems makes it easier for system leads to see which sites have started the application process and allows them to keep an eye on award progress across the system. What is the greatest value of the Environmental Excellence Awards program for Practice Greenhealth members? The awards program is much more than an application; it’s an ongoing cycle of continuous improvement. It helps members identify their baseline, measure progress, compare themselves to other hospitals and health systems and then use gap analysis to identify opportunities for improvement and goal setting. And it’s a wonderful opportunity to celebrate their accomplishments. The awards team extracts the data from the application and shares with the member in customized reports and enables the member to use that data to inform goal setting and programmatic strategy. Your applications allow us to identify outstanding instances of success that can be shared across the network for enhanced learning, and they help us use data to capture and promote impact. What have we learned from the awards program? The data from awards continue to demonstrate that hospitals can implement innovative, groundbreaking strategies for environmental stewardship while driving down costs. We continuously strive to enhance measurement of cost savings, environmental improvements, and health outcomes. The data also shows us that the work helps achieve other goals around health promotion, community benefit, and population health. Will you be letting members know of any outlier data before the March 6 deadline? We have continued to improve our data integrity process. This year, we are focused on data integrity through several strategies. We have a series of recorded calls reviewing data collection for each category, and we have been scheduling calls with members who had data outliers in different programmatic areas. In mid-February, we will send out an outlier email to help members identify and clean up current data outliers and use these tools and support from their member engagement manager to improve award quality and ensure they get the recognition deserved. Data integrity also improves the benchmarking process and makes the comparisons more statistically significant. Any additional advice for members considering participating in the Environmental Excellence Awards process? It is definitely not too late to apply. Reach out to your member engagement manager to learn more. We sincerely hope you will join us to celebrate success at the Environmental Excellence Awards Gala on May 9 in Nashville.